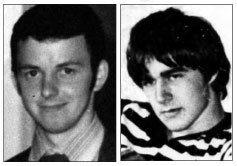 TWO young IRA Volunteers, Henry Hogan (20) and Declan Martin (18) were killed in an engagement with British armed forces in the mainly nationalist village of Dunloy, North County Antrim in February 1984. The young men were described by a comrade in An Phoblacht in the wake of their deaths as “courageous and dedicated Volunteers for whom fear held no meaning and to whom no task was too menial or too great”. Henry Hogan had participated in a number of successful IRA operations in North Antrim. The Hogan family had moved from Devon in England to Ballymena in 1973 but were forced to move out after intimidation from loyalists. They moved to Ballymoney and finally to Dunloy, only a month before Henry’s death. Declan Martin came from Bridge Street, Dunloy and joined the IRA when he was 17. He was the eldest of eight children and was said to have quickly earned the respect of his comrades for his willingness to learn and to develop his role as an IRA Volunteer. On 21 February 1984 an IRA active service unit, including Volunteers Hogan and Martin, ambushed an undercover unit of the British Army which was in hiding and observing the Hogans’ home in Carness Drive, Dunloy. The IRA had discovered the British stake-out and went in to engage the enemy. The IRA opened fire with a sub-machine gun, an Armalite rifle and a shotgun, killing one British soldier and critically wounding another. The third soldier escaped uninjured. As Volunteers Hogan and Martin were withdrawing across an open field they were overtaken by more British soldiers who had apparently been backing up the three-man surveillance team. Both Volunteers were shot dead and an eye-witness, Dominic McMullan, said he saw one of them being shot while lying on the ground. The British soldiers had emerged from two cars and another witness heard one of the Volunteers shouting for help after he had been wounded. The field where the Volunteers where shot was cordoned off by the RUC and the bodies were left lying there for over five hours. They were laid to rest in Dunloy and Henry Hogan’s brother Michael, a political prisoner in Portlaoise, was released on parole for his funeral. It was reported at the time that the British soldier who had died in the ambush, Sergeant Paul Oram, had been involved in the shooting of IRA Volunteers Charles Maguire and George McBrearty in Derry in May 1981. Speaking at Volunteer Hogan’s graveside, Gerry Adams, who had been elected Sinn Féin President the previous November, described Volunteers Hogan and Martin as freedom fighters. Henry Hogan and Declan Martin were laid to rest on 21 February 1984, 25 years ago.